Want to keep your home in tip-top shape year-round? 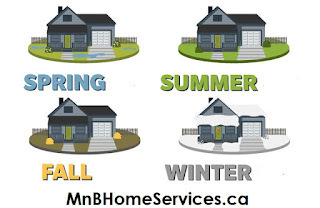 Use MnB Home Services for your home maintenance needs! Pressure wash house siding - remove dirt and debris from your siding and renew your house`exterior. We only use a low pressure to prevent damage to your siding. Lawn Maintenance - encourage healthy growth and prevent the spread of disease. When you just need your grass cut, trim and blow we have the package deal for you. Snow removal - driveways and walkways. We will add you on our route list. When the snow comes we will be there to clear it for you. Book regular cleaning service in the evenings or weekends and on your 4th clean you will receive a certificate for 2 Adult Admissions, 2 Regular Drinks, 1 Regular Popcorn. * No Cash Value - Minimum of Initial Cleaning Service + 4regular (weekly, bi-weekly, monthly) cleaning must be purchased. Initial Cleaning Service must be booked by May 30th, 2015Certificate does not cover 3D. Additional Cost per person applies. You will receive $15off your next service for every friend you tell. So tell a friend to tell a friend how to experience more free time in their life! *Initial Cleaning Service must be purchased.